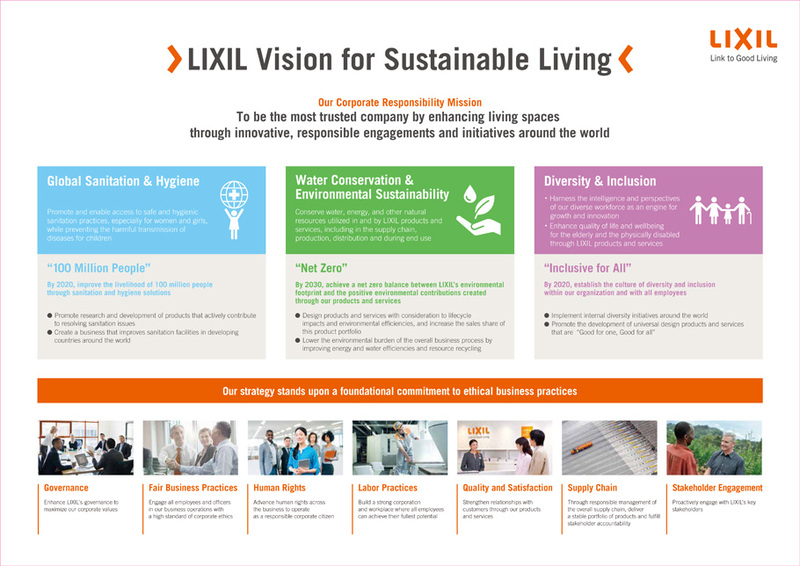 LIXIL is committed to enhancing living spaces through innovative responsible engagements and initiatives around the world. At LIXIL, we believe that our living spaces - the environment where we live, work and play - are critical to our daily lives and well-being. As a result, we are committed to ensuring that the growth of our businesses contributes to improving the quality of people’s lives, by delivering safe and comfortable products and services through responsible and sustainable innovations. Leveraging the scale and expertise of our four core technology business units, we are focused on making a positive impact in the communities in which we operate and on matters that require urgent action. Promote and enable access to safe and hygienic sanitation practices, especially for women and girls, while preventing the harmful transmission of diseases for children. Conserve water, energy, and other natural resources utilized in and by LIXIL products and services, including in the supply chain, production, distribution and during end use. Embrace the diversity of people in society and within LIXIL. This includes enhancing quality of life and well-being for the elderly and the physically disabled through LIXIL products and services, as well as harnessing the intelligence and perspectives of LIXIL’s diverse workforce, as an engine for growth and innovation.